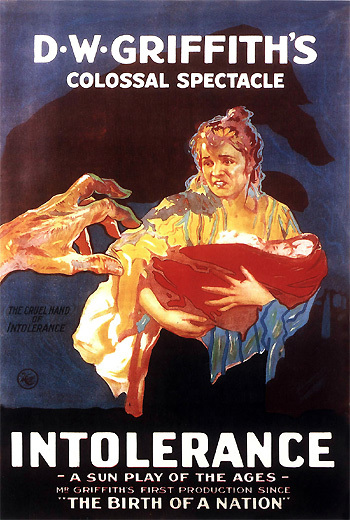 Director D.W. Griffith's expensive, most ambitious silent film masterpiece Intolerance (1916) is one of the milestones and landmarks in cinematic history. Many reviewers and film historians consider it the greatest film of the silent era. The mammoth film was also subtitled: "A Sun-Play of the Ages" and "Love's Struggle Throughout the Ages." Griffith was inspired to make this film after watching the revolutionary Italian silent film epic Cabiria (1914) by director Giovanni Pastrone. After the widespread controversy surrounding his racist masterpiece The Birth of a Nation (1915), Griffith attempted to defensively answer his critics with this work. He took a smaller feature film that he was working on about the contemporary, Progressive Era struggle between capital and labor [titled "The Mother and the Law"] and the theme of social injustice and combined it with three new stories to create a more spectacular, monumental, dramatic epic. All of the stories, spanning several hundreds of years and cultures, are held together by themes of intolerance, man's inhumanity to man, hypocrisy, bigotry, religious hatred, persecution, discrimination and injustice achieved in all eras by entrenched political, social and religious systems. THE 'MODERN' STORY (A.D. 1914): (Amber Tint) In early 20th century America during a time of labor unrest, strikes, and social change in California and ruthless employers and reformers - a young Irish Catholic boy, an exploited worker, is wrongly imprisoned for murder and sentenced to be hung on a gallows. The boy is saved from execution in a last-minute rescue by his wife's arrival with the governor's pardon. THE JUDAEAN STORY (A.D. 27): (Blue Tint) The Nazarene's (Christ's) Judaea at the time of his struggles with the Pharisees, his betrayal and crucifixion (told as a Passion Play in his last days) - it is the shortest of the four stories. THE FRENCH STORY (A.D. 1572): (Sepia Tint) Renaissance, 16th century medieval France at the time of the persecution and slaughter of the Huguenots during the regime of Catholic Catherine de Medici and her son King Charles IX of France, and the notorious atrocities of St. Bartholomew's Day Massacre (including its effects upon the planned wedding of a young innocent Huguenot couple - Brown Eyes and Prosper Latour). THE BABYLONIAN STORY (539 B.C. ): (Gray-Green Tint) peace-loving Prince Belshazzar's Babylon at the time of its Siege and Fall by King Cyrus the Persian, due to the treacherous High Priests - and the Mountain Girl's vain efforts to avert the tragedy. The outdoor set for the Babylonian sequences was the largest ever created for a Hollywood film up to its time, and its crowd shots with 16,000 extras were also some of the greatest in cinematic history. In his radically non-linear, hybrid film, Griffith simultaneously cross-cuts back and forth and interweaves the segments over great gaps of space and time - there are over 50 transitions between the segments. The villains of the four stories are mill owner Jenkins and his intolerant social reformers, the hypocritical Pharisees - opponents of Christ, the evil regime of the cunning Queen Catherine, and the treacherous High Priest of Babylon. Their powerful actions set in motion disturbing consequences for a modern-day working-class couple, for an average French Huguenot family and its soon-to-be-betrothed daughter Brown Eyes, for the Nazarene/Christ, and for the enlightened, revolutionary and benevolent Prince Belshazzar. The symbolic bridging device that interconnects and links together the various stories is the recurring cameo shot of Lillian Gish, his greatest star, as Eternal Motherhood. She endlessly and eternally rocks a cradle, accompanied by the title from Walt Whitman's poem Leaves of Grass: "Out of the Cradle Endlessly Rocking. Uniter of Here and Hereafter - Chanter of Sorrows and Joys." Her iconic image, rocking the cradle of humanity, serves as a symbol of continuity for the entire history of the human race, and a representation of the cycle of life and death. The film was the most expensive film of its time, costing about two million dollars (a third of which was used for the Babylonian segments), but it was commercially unsuccessful in the US, partially due to the financial burden of having full orchestration accompany the film. Its complex, sometimes baffling, unwieldy construction and its pacifist themes may have contributed to its unpopular reception just prior to the US entrance into World War I. Using cinematic methods ahead of their time and influencing a whole generation of future film-makers, he included a crane shot and spectacular crowd scenes and exterior sets (and live elephants!) for the fantastic Babylonian sequence. The innovative finale is an overwhelming, rhythmic, conglomerate sequence which weaves all four stories into a stirring, fast-moving and exciting climax - as the suspenseful drama begins to conclude, the cross-cutting increases in tempo and rapidity with shorter and shorter segments of each tale flowing together. Our play is made up of four separate stories, laid in different periods of history, each with its own set of characters. Each story shoes how hatred and intolerance, through all the ages, have battled against love and charity. Therefore, you will find our play turning from one of the four stories to another, as the common theme unfolds in each. "Out of the cradle endlessly rocking." In a medium shot (tinted blue), a young woman (Lillian Gish) rocks a large wooden cradle covered with roses. She is flooded from above by a beam of light. Three indistinguishable 'Fates' sit huddled together to the left in the background. The Whitman poem is paraphrased: "Today as yesterday, endlessly rocking, ever bringing the same human passions, the same joys and sorrows." Our first story - out of the cradle of the present. In a western city we find certain ambitious ladies banded together for the 'uplift' of humanity. The first episode is from the Modern Story. "Even reform movements must be financed." Two middle-aged ladies speak to a third stern-looking woman in an office about financing their reform movement: "If we can only interest Miss Jenkins - with her money - " They leave. "A little affair is being given by Mary T. Jenkins, unmarried sister of the autocratic industrial overlord -" An elaborate ballroom is filled with gentlemen and women dressed in formal evening clothes. The spinsterish, wealthy Miss Jenkins (Vera Lewis), sister of the boss of the Jenkins mill, speaks to guests at the ball - she looks bitter when young men are more attracted to prettier young ladies. She sees her aging reflection in a mirror: "Seeing youth drawn to youth, Miss Jenkins realizes the bitter fact that she is no longer a part of the younger world." "The Boy, unacquainted with the little Dear One, is employed with his father in the same mill." Both the Boy (Robert Harron) and his father leave their small bungalow and join a throng of men going to work and entering the factory gate. Comes now from out the cradle of yesterday, the story of an ancient people, whose lives, though far away from ours, run parallel in their hopes and perplexities. Ancient Jerusalem, the golden city whose people have given us many of our highest ideals, and from the carpenter shop of Bethlehem, sent us the Man of Men, the greatest enemy of intolerance. "Near the Jaffa gate." The streets of Jerusalem are crowded with merchants, townspeople, and camels for transport. "The house in Cana of Galilee." "Certain hypocrites among the Pharisees. [Pharisee - a learned Jewish party, the name possibly brought into disrepute later by hypocrites among them.]" As two bearded, self-righteous Pharisees (Gunther von Ritzau and Erich von Stroheim) walk along a street, others bow toward them. "When these Pharisees pray they demand that all action cease." A craftsman, a youth with a heavy bundle, and a toothless old Jew munching on an apple stop everything they are doing as one of the despotic Pharisees in their midst kisses the hem of his cloak and loudly prays upward, advertising his moral superiority: "Oh Lord, I thank thee that I am better than other men. Amen." Another period of the past. A.D. 1572 - Paris, a hotbed of intolerance, in the time of Catherine de Medici, and her son Charles IX, King of France. The scene opens with a long shot of a medieval French cobble-stoned street. Charles IX (Frank Bennett) receives his younger brother, Monsieur La France, Duc d'Anjou (Maxfield Stanley). In the splendid court scene, with a great crowd of courtiers, lords and ladies in the background with a backdrop of a giant lavish unicorn tapestry and chandeliers, the courtier Duc d'Anjou bows and kisses the hand of the bon-bon-eating king seated on the throne. His tyrannical, crafty queen-mother Catherine de Medici (Josephine Crowell) is the real power behind the king. The heir to the throne is the effeminate, foppish Monsieur La France who plays with toys and pets. "Pets and toys his pastimes." He wears ear rings and holds two puppies in a lap basket. "Catherine de Medici, queen-mother who covers her political intolerance of the Huguenots beneath the cloak of the great Catholic Religion." [NOTE: Huguenots - the Protestant party of this period.] The great Protestant leader is white-haired Admiral Coligny (Joseph Henabery), head of the minority Huguenot party. Catherine (whispered to son): What a wonderful man, the Admiral Coligny, if he only thought as we do. Coligny: (spoken to a friend) What a wonderful king, if he only thought as we do. When the King embraces Coligny, "the King's favor to Coligny increases the hatred of the opposite party" and the enmity of Duc d'Anjou. "Celebrating the betrothal of Marguerite of Valois, sister of the King, to Henry of Navarre, royal Huguenot, to insure peace in the place of intolerance." A cheering crowd lines the streets to celebrate the royal marriage, and to watch the festive procession of a carriage carrying a coquettish Marguerite of Valois (Constance Talmadge in one of her two roles in the film). Flower-garlanded girls throw flowers at the parade. Her bridegroom, Henry of Navarre (W.E. Lawrence), rides on horseback between banner-wielding marchers. Helmeted guard soldiers with pikes are lined up on the side. "Brown Eyes, her family of the Huguenot Party, and her sweetheart, Prosper Latour." Other Huguenot lovers, Brown Eyes (Margery Wilson) and Prosper Latour (Eugene Pallette) are introduced as the main protagonists - in an extreme closeup, the brown-eyed young woman gazes wistfully at Prosper outside her home. A foreign Mercenary (A.D. Sears) focuses on their goodbye and is immediately attracted to her beauty. The Modern Story: "Returning to our story of today, we find the embittered Miss Jenkins aligning herself with the modern Pharisees and agreeing to help the Uplifters." The blue-nosed sister of the factory boss approves the financial requests of the puritanical, self-righteous, proselytizing reformers. After a brief shot of a dance hall party for the factory employees - "a diversion of the mill workers," the Judean Story's tablets fade in with a quote from Ecclesiastes iii: "To everything there is a season...a time to mourn and a time to dance...He hath made everything beautiful in his time." The little Dear One has the time of her life at the dance - she drinks an ice cream soda from a straw at the fountain. "Miss Jenkins receives a check from her brother for the purposed uplift of humanity." In the library, factory boss Jenkins (Sam de Grasse) hands his sister a check for the reformers. "Jenkins studies his employes' (sic) habits." His chauffeured limousine pulls up in front of the mill workers' dance - it is the Third Annual Dance given by the Employees of the Allied Manufacturers Association according to a sign. Jenkins stands at the entrance and looks in, holds his pocket watch, and comments: "Ten o'clock! They should be in bed so they can work tomorrow." Jenkins, the power broker in the Modern Story, is juxtaposed to the High Priest, the authority figure of the Babylon Story that is presented next. The fourth story, the Babylonian Story, is the last to be introduced in the film, prefaced again by another turn of the pages of the book - now with carved cuneiform figures on the upper margin: "And now our fourth story of love's struggle against Intolerance, in that distant time when all the nations of the earth sat at the feet of Babylon." The rocking cradle appears once more as a link. Outside of Imgur Bel, the great gate of Babylon in the time of Belshazzar, 539 B.C. Merchants, farmers, East Indians, with trains of elephants, Egyptians, Numidians, and ambitious Persians spying upon the city. An iris opens from the lower right part of the frame on part of the gate of Imgur Bel, expanding to include an exterior shot of the massive gate and towering walls of the city of Babylon. Crowds of people are on the top of the high walls, and milling around the outside of the gate. A procession of elephants enter carrying goods. Two characters are introduced: "The Mountain Girl (Constance Talmadge - again) down from the mountains of Suisana," a raggedly-dressed girl, and "The Rhapsode (Elmer Clifton), a Warrior singer - poet agent of the High Priest of Bel." From a window in a tower overlooking the city, "the priest of Bel-Marduk (Tully Marshall), supreme God of Babylon, jealously watches the image of the rival goddess, Ishtar, enter the city, borne in a sacred ark." He is contemptuous as dancing girls (the Ruth St. Denis Dancers) perform in front of the statue as it is pulled along. The Rhapsode makes romantic overtures toward the Mountain Girl: "Dearest one - in the ash heaps of my backyard there will be small flowers; seven lilies - if thou wilt love me - but a little." She looks bored and scorns his advances and attentions, preferring instead to watch the parade. He persists and prays to the rival goddess before kissing her lightly on the neck: "Ishtar, goddess of love, seven times seven I bow to thee. Let her enjoy this kiss." "On the great wall. The Prince, Belshazzar (Alfred Paget), son of Nabonidus (Carl Stockdale), apostle of tolerance and religious freedom." [NOTE: - Replica of Babylon's encircling walls, 300 feet in height, and broad enough for the passing of chariots.]" In a spectacularly-composed shot, the Prince is pulled along in a chariot on the top of the wall, while below the wall to the left of the frame, the procession of Ishtar proceeds to move ahead in the distance. Belshazzar is fanned by servants. "The two-sword man, Belshazzar's faithful guard, a mighty man of valor," (Elmo Lincoln) is pictured as a broad-chested, muscle-bound warrior with a fearsome sword. "The intolerant High Priest of Bel sees in the enthronement of rival gods, the loss of his own great powers in Babylon." His eyes flash at the rival procession - he fears the loss of his religious power (and the sect of Bel-Marduk) if Belshazzar promotes religious freedom and the worship of Ishtar, goddess of love. "The gate of Imgur Bel which no enemy has ever been able to force." The giant, elaborately-carved gate is opened when slaves at each side move massive wheels on a turntable. "Hand maidens from Ishtar's Temple of Love and Laughter" dance through the opening, introducing the great statue which is pulled by many men on a platform - burning incense fills the air with smoke. "The Princess Beloved (Seena Owen), favorite of Belshazzar, in a room of scented cedar, plated with pure gold, in the hareem of My Lord the Prince." The Prince's servant brings a flower to the ornamentally-dressed Princess - it is "a love blossom from Belshazzar. Stricken by her pale beauty, as though by white lightning." She holds the long large lily to her face. "The brother of the Mountain Girl, having some slight trouble with his high-spirited sister, takes the matter to the court." She is dragged, after some struggle and resistance, by her brother (Arthur Meyer) to "the first known court of justice in the world. [NOTE: - Babylonian justice according to the code of Hammurabi, protecting the weak from the strong.]" There, the judge (Lawrence Lawlor) is told by the Mountain Girl's brother that "she is incorrigible." He describes how he must protect himself from her aggression. She is beckoned forward, but soon engages in a clawing, scratching fight until a judgment is pronounced and ordered: "The judgment is that she be sent to the marriage market to get a good husband."